At first all the various rounds which one can shoot seem very confusing, but after a while you will get the hang of them. I have found it quite difficult to find online, decent presentations of how you can achieve certain standards - called 'classifications'. I wanted to be able to see what score needs to be achieved in any given round so that I can qualify for an award, usually a badge. 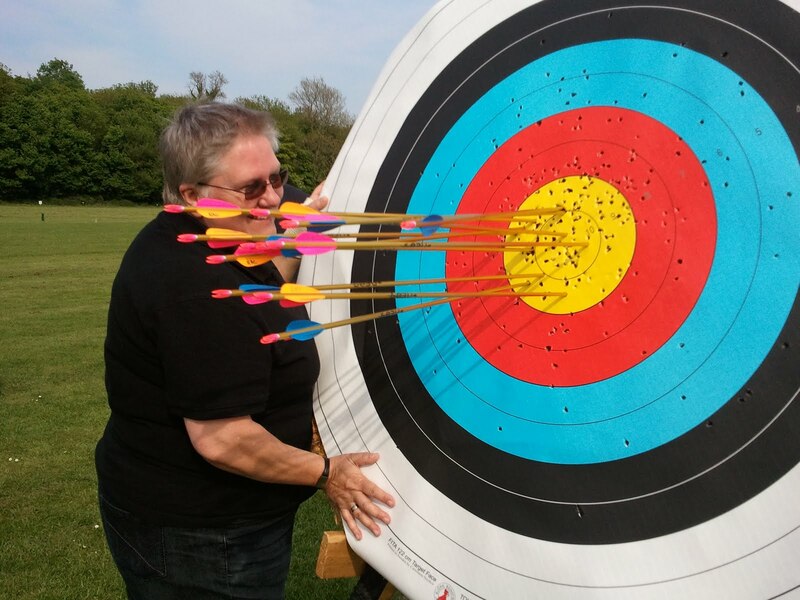 Some extensive googling led me to the Yorkshire Archery Association's excellent site. Once found, I made up my own chart combining the rounds and classifications, which I keep in my scorepad. They have made available tables which you can view online. You can also download them. Choose the ones relevant to you and view them in Excel, then you can see exactly what you need to aim for and mark off your achievements. I think you need to look at the classifications table first so that you can see which round actually has an award to aim for. Then, go and find the round or rounds which match the distances you are ready to shoot. By way of illustration (and your skills will differ from mine), putting the two together, you will see that a Junior Western round means shooting 4 doz arrows @ 40 yds followed by 4 doz @ 30 yds - a total of 96 arrows and total possible score would be 864. Imperial rounds are shot at yards distances and with 5-zone scoring: gold = 9, red = 7, blue = 5, black = 3 and white =1. Metric rounds are 10-zone scoring with each colour divided into 2 and a bonus if you hit the X-zone, the minute circle right in the middle of the gold. (The bonus X score comes into play if you tie on points at the end of the match. This, X, 10 and 9 are all gold, 8 & 7 red, 6 & 5 blue, 4 & 3 black, 2 & 1 white. One more tip when calling scores - if you think it's a line-cutter call the point as such. Your fellow target competitors need to say if they think you are mistaken, not the other way round. So, if it's touching the red/gold line call it as a definite 9 - don't ask first! Shooting barebow, I wanted to make sure I could shoot fairly accurately at the shorter distances before moving on to the longer ones, so the Short Junior Western suited me fine to begin with - 4 doz @ 30 yds then 4 doz @ 20 yds. In the Ladies Barebow Imperial table I saw that I needed to achieve a score of at least 497 in order to qualify for the 3rd class award - and I must do this 3 times**. (Divide that by 96 and it tells you I needed an average of just over a 5 with every arrow.) It's a good starter round. Gentlemen, you can't achieve an award doing a Short Junior Western, you'd have to go for the Short Western perhaps, and get 289 - the round itself being 4 doz @ 50 yds + 4 doz @ 40 yds. (Ave just over 3 per arrow.) Easy-peasy! Juniors (eg under 16 with a recurve) - how about a Short Junior National where you need to get 440 for the 3rd class award. Your targets will be 4 doz @ 30 yds + 2 doz @ 20 yds - 72 arrows for an average score per arrow of just over 6. If you do this barebow then the score to aim for is 223 (ave 3 per arrow). BTW, Juniors under 14 can achieve their 2nd class by shooting 497 in this round. If you have a SmartPhone, pop the tables onto that so they are handy - and if you run Android, then I can recommend the excellent Archery Scorepad App which will help you keep track of your scores and log your progress - you can even email them to yourself and your records officer (if he/she would like them in that format). Archery Companion is another app which I used to use, but it doesn't look as if it's still available at time of writing. However, it's a bit easier to look up specific rounds, but doesn't have the export and one or two other nice bits and pieces that Archery Scorepad has. Don't forget to send your scores through to your Club Records Officer. ...Oh dear - too far away for my skills at the time, but had I been able, (and assuming I could do it three times in the following weeks), then a score of 67 would give me the 3rd class award, 149 2nd class, 278 1st class and 435 the pinnacle award for this round of Bowman. I actually shot a Junior Windsor - I'll leave you to look that up for practise! ** One interesting thing to note - to attain 3rd Class, 2nd Class etc, you don't have to shoot the same round every time. As long as you achieve the required score in any 3 types of round, then they are put towards the award (ie in my case 2 x Short Junior Western & 1 x Junior Windsor). Now isn't that cool! Having completed my training, the best advice I was given was to work to achieve top scores at short distances before moving on to the more distant targets. Believe me, there is nothing more satisfying that getting all your arrows in the gold every time!